Call tracking is better than having no call attribution at all, but are you using the data to its fullest potential? Basic call tracking isn’t enough. It is a great first step to track your calls, but a deeper dive into your call data will reveal information that will allow you to maximize not only your marketing efforts but your business as a whole. Don’t rely on your instincts alone. Leverage your basic call tracking data to help you learn where to focus in on and set goals for improvement. 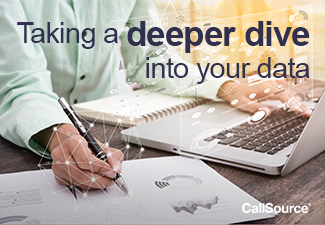 If you need help dissecting any of your data or tips and tricks, subscribe to our blog and or drop us a line on how CallSource can help maximize your call data. If you have been following our blogs, we’ve talked about how beneficial call tracking is to your business. Basic call tracking provides you with the information regarding whether your ad sources are generating phone calls for your business and if that ad spend was worth it. This is all great information, but there is a wealth of data that you can use for your business that you might not even be considering. When we talk about tracking calls, the first thing we think about is call volume. We know it may be hard to expect your business to answer all calls that come in every day if you have a higher than average call volume, but know that there is potential revenue tied to any calls that do go unanswered during normal business hours. By understanding that there is ebb and flow or trend in your call traffic, you can utilize the call tracking data to maximize staff scheduling for those peak times and create a follow-up plan for missed calls. If a lot of calls are consistently being missed, that is a different story than just regular ebb and flow. Besides following up on missed calls, ask yourself if it makes sense to add more call handlers to your team? Can schedules be rearranged? Take a look at your call volume data to make data-driven decisions to maximize your business’s profitability. The next step in focusing on your call tracking is to examine the calls that were connected and answered by your business and categorize each call by their caller attribution. Doing this allows clearer view of which ad sources are bringing in actual revenue-generating prospects and which ones are not. This will provide an overall view of your marketing health helping to determine which ad sources are generating actual prospects for the business. It also shows whether or not you need to have “that” conversation with any of your ad marketing vendors. Remember, there is a difference between leads and actual prospects. Make sure your advertisements aren’t misleading and are targeting the right types of callers. Determining your call attribution will help you dial in and have a better focus on your best and worst performing ads. After understanding where your calls are coming from, when to maximize staffing, and knowing what ad sources are generating actual prospects you will also need to focus on how these prospects are being handled by your staff. After having spent “$x” amount on making the phones ring, it is vital to determine if you are or are not getting them into the business or setting up that appointment. Listening to the prospect calls allows you and your leadership staff to hone in on these calls and understand what is being said to these prospects that leads to an appointment—or doesn’t. This serves two purposes within your business team—it helps you understand who your top performers are, and who needs additional training. You can incentivize top performers and create a culture of friendly competition within your four walls to get more “yeses” and maximize business profits. Check out how to incentivize your sales team with non-cash incentives if you need ideas.